This building occupied the riverside site near Lendal Bridge now occupied by the Aviva offices. See comments added for more information. 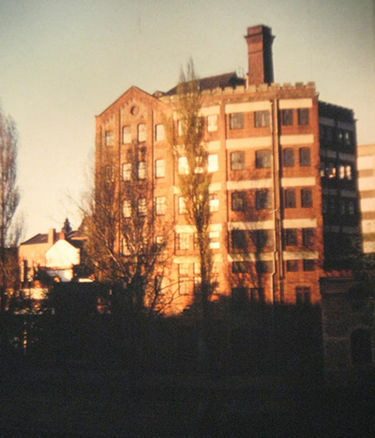 That building on Tanner Row was the original Rowntree factory prior to their move to Haxby Road. In more recent times, before demolition, it was the factory of Armstrong Oilers (they made automatic lubricating equipment for fit to works’ machinery). This historic factory was, sadly, removed completely for the construction of the Norwich Union Insurance Building (now called Aviva) in the neo-Gothic style. Prior to his there was plans for the site to become a tourist-orientated centre with a giant IMAX cinema. But the proposal ran out of money and was never built.